The research is clear. A high-quality, systematic, well-thought through and balanced curriculum is critical to preparing all children for future success in life. All students should have a broad curriculum that aims at their enrichment wherein they find learning to be engaging. The Scholastic Programme at NPS, Koramangala is a comprehensive and complete curriculum that has a flexible and easy-to-use format. It provides explicit instruction in all language, reading, science and math skills. It admirably combines child-centred explorations with teacher-directed instruction. Above and beyond, it also provides in-depth and on-going formal and informal assessment through the year. 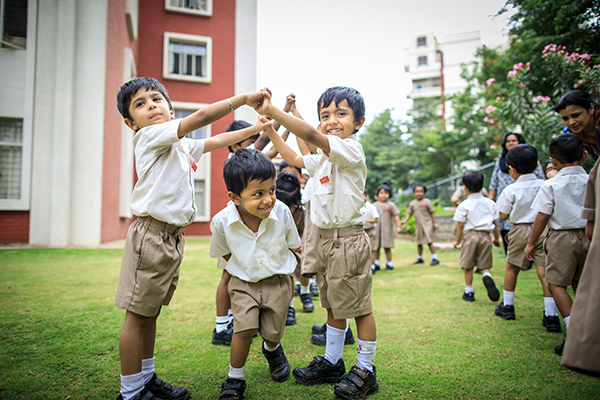 The Kindergarten curriculum at NPS, Koramangala reflects the openhearted and imaginative way with which young children see the world. Kindergarten is where the students’ preschool education meets their future elementary school learning. There is still plenty of playing, singing, and craft-making in kindergarten, but it is often balanced with more rigorous writing, reading, and Math lessons. A rich tradition of oral language and classic stories provide the backdrop for the child’s first exploration into the world of literacy. Students are immersed in a language-rich environment as they listen to stories, recite poetry, and learn new songs. Math skills are fostered through working with patterns, grouping and sorting, and learning to draw geometric shapes. Science, Arts & Crafts, Music round out the Kindergarten experience. Students are involved in a variety of learning opportunities such as nature walks, painting, puppetry, games, and movement activities. Thus, a healthy, nurturing rhythm of learning is established. Kindergarten Curriculum is designed to give the child a sturdy start in school and in life. It provides four and five year olds an engaging, inquiry and play-based learning program during the regular school day. The teacher-student ratio is well adhered to, ably supported with a well-trained, caring and empathetic support staff. At NPS Koramangala, we strongly believe that education is a preparation for life. To quote Charles Handy, “Instead of a national curriculum for education, what is really needed is an individual curriculum for every child“. In keeping with this adage, we try our best to give customised and bespoke attention to each and every student of ours. Research shows that environments which are nurturing and supportive promote optimal early childhood development, which greatly improves children’s ability to learn and adapt. The Montessori Curriculum is an innovative learning framework that incorporates specific learning outcomes and knowledge skills to align with children’s evolving needs and interests. It is divided into five key areas of learning: practical life, sensorial, arithmetic, language, and culture; which in turn are based on Dr. Maria Montessori’s findings about the significant developmental stages children move through from birth to age six and beyond. Our teachers act as facilitators providing children with a well organised environment intended to optimise their learning. This includes hands-on learning, adequate guidance, freedom of choice, co-operative social exchanges among children of mixed ages supported by a wide array of Montessori materials. Our classrooms are designed to be child friendly, well ventilated, bright, airy with low shelves, stools, mats for comfortable seating in keeping with Montessori standards. The teacher-student ratio is well adhered to, ably supported by a well-trained, caring and empathetic support staff. Within this environment, children participate in the full three-hour work cycle involved in activities that are conducive to their emotional, social and intellectual development. The sequence of daily activities provides children with important preparation for school skills, such as concentration, working in collaboration, time management and the ability to follow instructions. 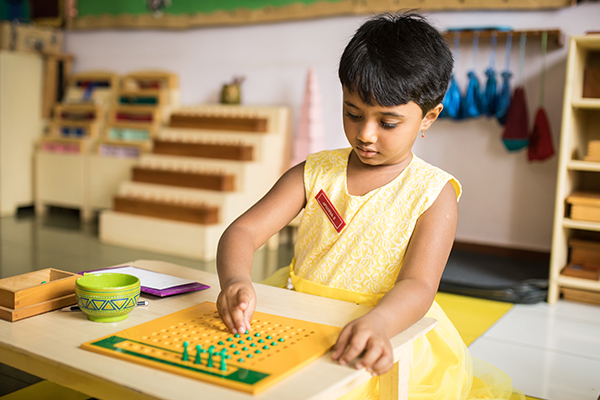 In this way, Montessori inspires children to become independent, self-motivated learners with strong academic foundations. Education is the spine of every nation! The better the education, the better the nation! The mediocre the education, the mediocre the nation! And mediocrity is not what we settle for at NPS, Koramangala!!! The Primary Curriculum is one that consistently challenges the pupils, and does not allow a single day to be wasted. The curriculum aims to ensure that all children are provided with learning opportunities that recognise and celebrate their uniqueness and develop their full potential, besides equipping children with essential and important life skills targeted at functional literacy and numeracy. We take pride in saying that we manage a fine line between tending to students with special needs and yet recognising the needs of gifted children too. The curriculum is presented in several areas comprising a multitude of disciplines with a striking co-existence of scholastic and co-scholastic disciplines. Content based core disciplines like Mathematics, Sciences, and Languages are imparted to ensure students have a good grounding and awareness in all areas of study. Pilot projects like Enquiry Based Learning in Science and Writing Process in English have been adopted to facilitate learner centric education. From the nurturing cocoon of primary years to the opening horizons of middle school, transition for our young adolescents is smooth which ruffles but a few feathers as they glide through the expanding skies of knowledge. Grades 6-8 students experience tremendous intellectual growth. 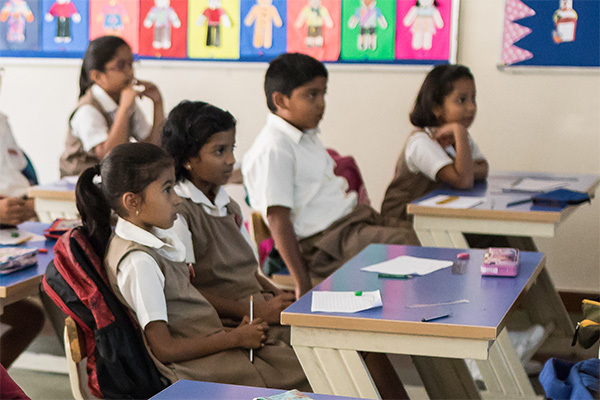 Their developing skills in deductive reasoning, problem solving, critical thinking and generalizing makes it challenging and gratifying in their deeper understanding of the core subjects like English, Hindi, Mathematics, Science, Social Science and Computer Science. Participation in myriads of inter-house, inter-school and extra-curricular activities ushers our young scholars to the avenues of hitherto undiscovered aptitudes and talents. As they expand their wings and gain greater strength, our vivacious young adults are equipped to meet the demands of advanced levels of academics. The school opens the floodgates of opportunity for them to hone the specific skill sets namely leadership, organization, communication, presentation, team building, independent learning, social skills and many more. Students explore their potential and enhance their competencies through scholastic and co-scholastic activities throughout the year. These secondary years are some of the most enriching ones when students are evolving into industrious, focused and self-assertive youth who begin to fathom the depths of various subjects. They understand the dynamics of juggling homework, tests, presentations and a wide range of intra and inter-school competitions. For these progressive young minds there isn’t a single dull day. Hands on experiments, interactive study sessions, enquiry based assignments and analytical collaborative learning leads them to nurture a penchant for the subjects. Off the classroom, they acquire the skills required for different sports; perfect their oratorical or organizational abilities; grow doing projects relating to community, social service and much more. 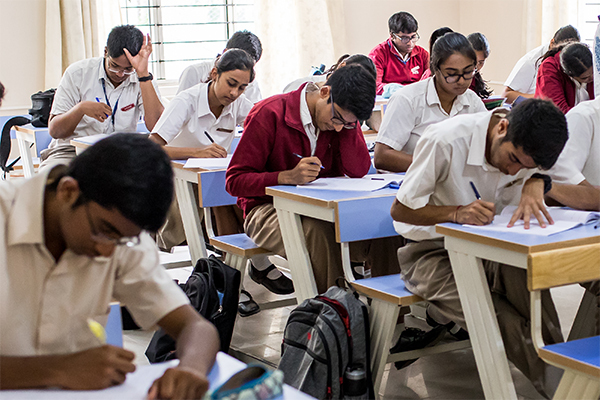 The subjects offered in grades 9 & 10 include English, Science, Social Studies, Mathematics, Sanskrit /Hindi /French. Environmental Education, PHE, Yoga, Work Education and Visual & Performing Arts are also part of the curriculum. Senior Secondary level calls for even more intensive subject matter as our young men and women walk towards the threshold of choosing exciting careers for themselves. The subjects offered are Mathematics, English, Physics, Chemistry and Biology/ Computer Science/Economics. All vital resources are pooled in from all three stakeholders namely- school, student and the parents, to cheer them through the finishing line successfully. The school ensures that they stand tall as confident, resilient, adventurous, wise and creative beings who are raring to embrace the new life. To achieve this goal, student are offered significant roles to play in and out of school. They plan, organize and execute major yearly events. They educate and train their juniors to leave a legacy of their fine print and to represent their alma mater in numerous happenings throughout their schooling years.